If you’re in the market for a new vacuum cleaner, the Shark IONFlex 2X DuoClean should be in your top five. Shark already has a reputation for being more affordable than other premium brands like Dyson (check out our Shark vs Dyson article for further on this). 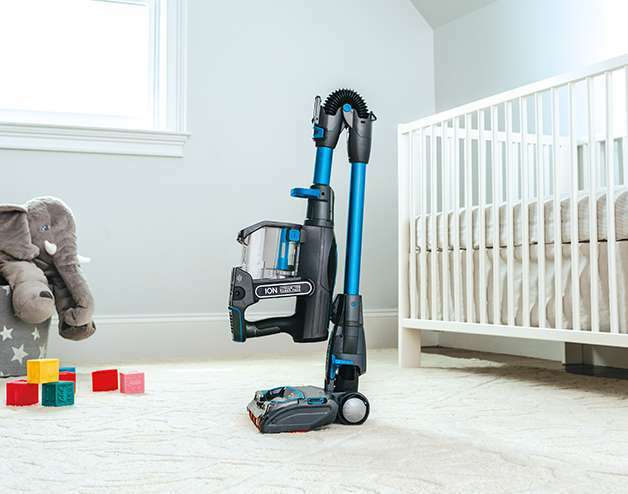 This new cordless Shark vacuum aims to compete with the Dyson V8 and is similarly priced. As with the other vacuums in the SharkClean range It offers an attractive warranty, making it easier for first-time Shark owners to see the value in what they are paying for. Let’s take a look at some of the specific features of the Shark IONFlex 2X DuoClean. * this doesn't come with Model 2X IF251 - can be bought separately here. The pros definitely outweigh the cons if you take everything into consideration. 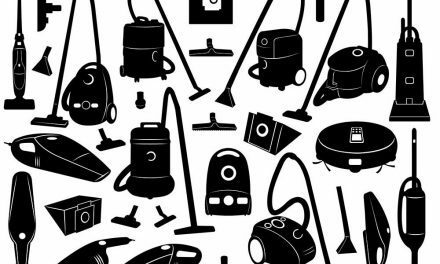 Most of the problems that could arise with this vacuum can be avoided if the product’s owner is conscious of them. 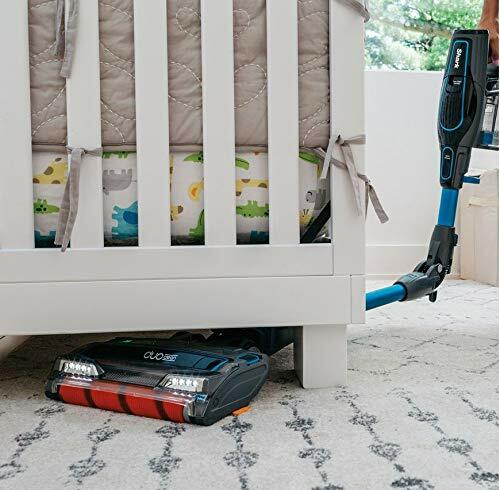 The 2X in the product’s name is referring to its special battery component - one of the major advantages of this cordless Shark vacuum is indeed the two ion battery packs. These lithium-ion batteries are the latest technology and provide a long run time considering the strong suction power. Also, because you can swap the batteries out for the spare you can get more cleaning done in one go compared to other cordless models with a single battery. If you forget to charge the battery the night before you have guests, you can make sure there is always one on the charging station. This feature may make the Shark IONFlex 2X more attractive than the Dyson cordless vacuums to some consumers, since they only have a single battery that cannot be removed. In addition to this vacuum being a power house, it also comes without the hassle of cords. That means that you can maneuver around the house without having to worry about your vacuum cord snagging on the couch or dinner table. You also won’t have to worry about plugging it into a new outlet when you’re ready to move on to the next room. The product as a whole is lightweight, so if you need to get in a space that is high up, you won’t strain your back in the process. 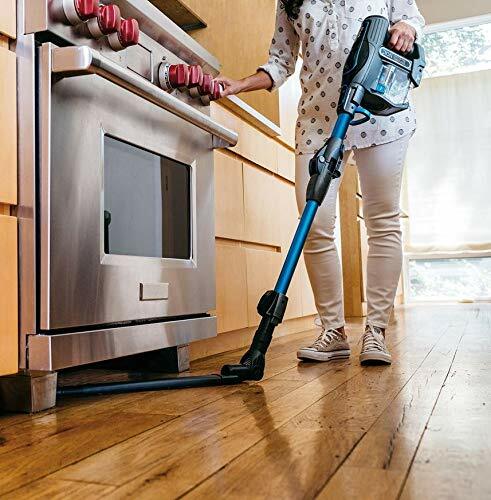 Additionally, the Shark IONFlex 2X can be converted into a handheld vacuum. It is easily detachable from its body if you want; in between the couch cushions or on individual steps. Since it runs on batteries, you can also bring this vacuum outside to clean the inside of your car. This vacuum is designed to clean a variety of flooring, from hardwood to carpet. It is equipped with different features to tackle particles on multiple surfaces without the need for additional attachments. Whether you want to give your carpets a deep clean or give your hard floor a polished look the DuoClean Technology was designed for either surface. There are two brush rolls in the IONFlex 2X DuoClean head unit: a bristle brush for carpets and an additional soft brushroll to pull in larger particles and directly engage floors to give a polished appearance. Thanks to the flexible design of this product, you can get into tight spaces that might otherwise require you to move furniture. It comes equipped with a bonus Under-Appliance Wand, allowing you to reach underneath your stubborn kitchen appliances. It has been said to “turn on a dime,” letting you pivot around the area you are cleaning with minimal effort. The Shark IONFlex 2X DuoClean can also be folded over when you’re finished cleaning. There is a hinge in the middle of the wand that allows it to pivot and fold over on itself. This allows the IONFlex to stand up on its own. Comparable products take up more space and don’t have freestanding capability. The MultiFlex feature also makes it easier to vacuum underneath tables and other furniture items. Larger vacuums typically don’t have the reach or ability to clean in tight, awkward crevices. 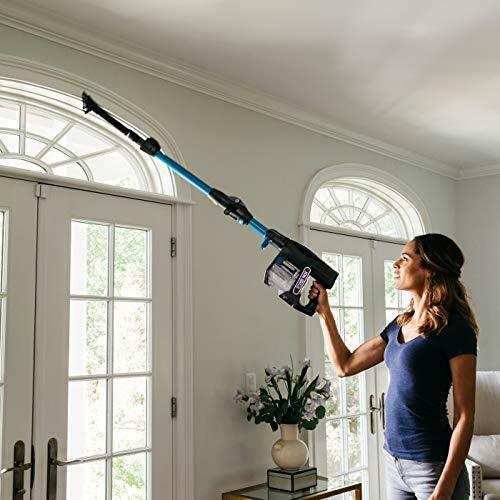 You’ll no longer have to get down on your hands and knees when you want to dust the baseboards in your home – this Shark has got you covered. Its dual-purpose will also allow you to clean the blinds without leaving lines of dust behind. The Shark IONFlex 2X DuoClean comes equipped with special tools for pet owners and allergy sufferers. There are two features of this vacuum meant to tackle animal hair, depending on your pet’s level of shedding: a bristle brush and an extra upholstery tool. The bristle brush can be easily detached to access the upholstery tool. Additionally, you can upgrade your package to include the anti-allergen dust brush. Although this option is a bit more expensive, it will remove unhealthy particles from your home that could trigger an allergic reaction. The dust bin is located on the top of the handle near the battery pack. Although it is fairly small (0.3 quarts), it does not require a lot of effort to empty out. No vacuum bags are required to use this product, saving you from a reoccurring cost in the future. Individual battery life is limited on high speed: Some consumers have noticed that having this vacuum on the highest speed for too long drains the battery quickly. This shouldn’t be an issue if you always remember to keep your spare battery charging. If this doesn't provide enough runtime for you then a corded lightweight vacuum might be more suitable for your needs. 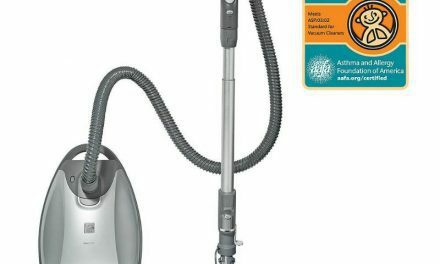 We like the lightweight Shark Rocket DeluxePro, which we reviewed in our Best Lightweight Vacuum Reviews. Batteries can take approximately half an hour to cool down prior to charging after use. The charger indicates via a double blue light warning if the batteries are too hot. However, if you simply leave the batteries in the charger it will start charging them once they are cool enough. Potential clogging: The handle of the vacuum may get clogged if you are trying to pick up too many small pieces at once – especially hard materials like plastic. Top heavy: Although this vacuum is freestanding, this feature is only possible when it is folded over. Keep this in mind if you take a break during cleaning. It is also feels heavy when using in handheld mode compared to other hand vacs. However the handheld unit weighs the same as the Dyson V8 at 3.5lbs. Small dust bin: Since this model is so lightweight, the dust bin on the top of the handle isn’t very large (approx 0.33 liters). This compares to 0.54 liters on the Dyson V8 (39% larger). On the plus side, it is very easy to detach and empty out. Just make sure you keep a bag or trash can nearby if you’re planning on cleaning a particularly large space. The two video's below courtesy of the VacuumAdvisor provide an overview of the positive (video 1) and negative (video 2) aspects of the Shark IONFLex 2X Duoclean (IF252). Some of the points raised we've already covered in our review above but the videos provide an indepth look at this cordless vacuum's key features and assets. DuoClean Technology - on tests they rate the suction and dual brushroll performance as good at picking up large and small particles from a variety of floor surfaces. The front brushroll also allows the vacuum to pick up debris close to walls. Performance on pet hair is also rated as good but pet hair can get trapped on the brushroll. However highlight that this can easily be removed with the easy access that is provided. Using the handheld with the wand is heavy - when using the vacuum in handheld mode at elevated levels it can't be used for too long as it is heavy (approx 4.7lbs depending on tools attached). 2 x Lithium ION Batteries - so you never run out of power and have to wait to finish your cleaning. The battery is easy to swap out and can be charged either via the supplied cradle, or via direct connection to the battery or the vacuum itself. Multi-flex Technology - they were not overly impressed with this feature. 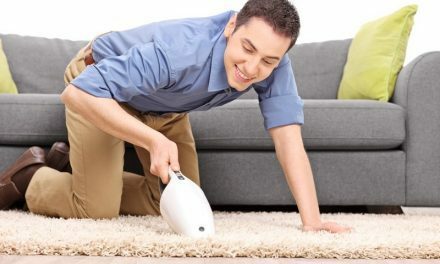 The technology allows the vacuum to stand on its own and provides assistance for cleaning under furniture. They think the solution is not that elegant and also a little awkward to use. Battery Charge Indicator Lights: you can see the charge remaining on the battery. There are 3 bars on the battery to indicate remaining charge: low, medium and high charge. This is helpful to see how much charge is left whilst vacuuming. You can also see how much the battery is charged when charging so you can estimate how long is left until it is fully charged. Debris left behind vacuum on pull back of vacuum - on tests the vacuum leaves a little bit of debris behind it when dragging it back. This improves in high power mode. In our view this is a very minor issue and doesn't detract from the IONFlex's overall performance. 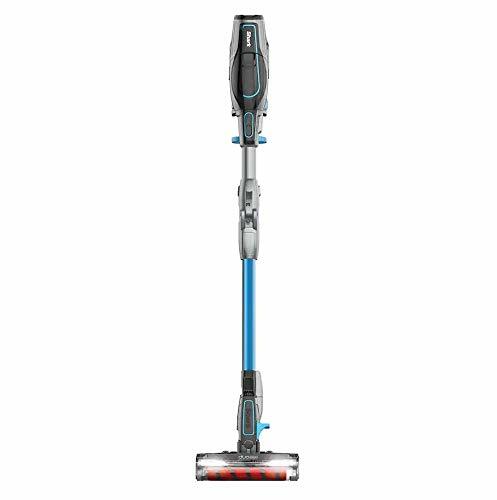 2-in-1 Feature - a full stick vacuum and a hand vacuum. This isn't available on all stick vacuums. Cleaner head tends to pull itself forward - you can feel the tension in pulling the vacuum back, which can become tiring after prolonged use. We think this means you will get a good workout whilst vacuuming! Vacuum controls - easy to use and control with your thumb on the handle. Controls are provided on the handle for: on/ off, bare floor/ carpet modes and high/ low power. Handheld unit feels heavy - although the weight is the same as the Dyson V8, The placement of the battery in front of the wrist as opposed to below the wrist on the Dyson may be a reason for this. Recharge time is extended if battery is hot after use - temperature of the battery has to lower before it will charge. This can take from 30 mins to an hour, extended the 3.5hr recharge time. 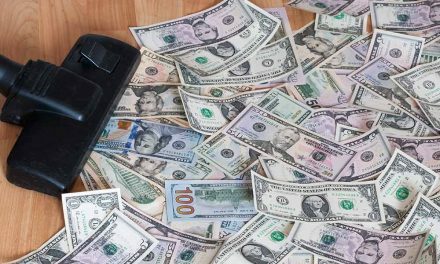 Although this vacuum comes with a higher price tag, you get what you pay for. 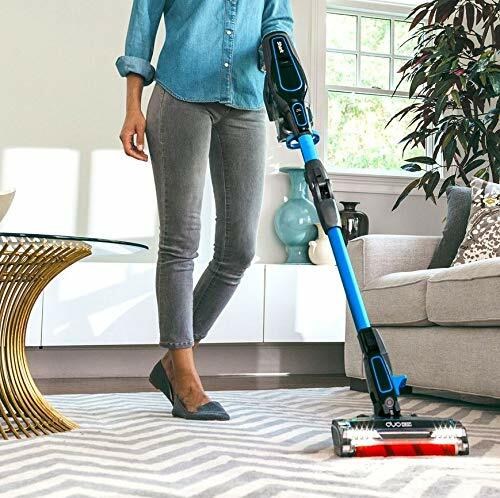 The Shark IONFlex 2X is equipped with modern technology that minimizes the stress of cleaning your home. Its mobility allows you to clean outdoor spaces like the inside of your car and patio furniture. It has a competitive warranty with other similar models on the market, giving you a safety net at the time of purchase. Despite the size of the vacuum, it has powerful suction that can handle a variety of surfaces if the flooring in your home is not consistent.